The San Francisco Mint: Study California Gold Coins and San Francisco History. The San Francisco Mint: There's Gold in Them Thar Hills! The San Francisco Mint was a key player in the immediate aftermath of the California Gold Rush. A few short years after the discovery at Sutter’s Mill, the San Francisco Mint began turning out gold and silver coins. Continue reading on, and learn why in the hearts of many San Franciscans, the Mint became much more highly regarded than just a coining facility. Hit the "Saga of the US Mint Chapters" link at the upper right to choose other US Mint facilities to study. The headings directly below are units of the SF Mint chapter. 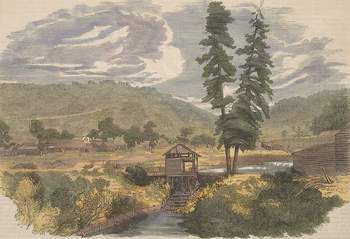 Sutter's Mill, where California gold was discovered. This engraving, as it appeared in Gleason Pictorial Drawing Room Companion, shows the mill and the town of Coloma in the background. Public domain image. The date: Monday, January 24, 1848. The morning began as a routine work day for James W. Marshall. As a contractor hired by John Sutter, a German immigrant who was building a prosperous sawmill company in the Sacramento Valley of the California Territory, it was Marshall's responsibility to oversee construction of a new mill on the American River. While at the jobsite this particular day, Marshall happened to detect the sun's rays bouncing off a small glistening object in the water. Was it.... could it be.... gold? Secretly, Sutter subjected the rock to a battery of tests to confirm that yes, the tiny nugget was indeed gold! Despite Sutter's desire to keep the discovery secret, word leaked out that gold had been found in California. By 1849, stories of incredible overnight fortunes made headlines throughout the world. Dreams of riches stirred the imagination of the boldest adventurers. John Sutter wrote that he had expected to be one of the richest men on the Pacific coast with his saw mill company, but blamed the sudden discovery of gold on his property for his ruin. Sutter spent the remainder of his life seeking compensation for his losses, but died a disappointed man in 1880. Public domain image. By the thousands, the "49ers" flooded the California gold fields in a mad rush. John Sutter's land was overran by squatters, some of whom successfully mounted a legal challenge to Sutter's title to the property. Ironically, the landowner where California gold was first discovered was forced to file bankruptcy in 1852. Within a few short years, the California fields had produced an abundance of gold. The population soared to over 100,000, bringing statehood to California, as a provision in the Compromise of 1850. The quiet community of San Francisco was rapidly transformed into a hopping boomtown, where businesses catered to the needs of the 49ers. Still, there was a severe shortage of legal tender to facilitate financial transactions in the gold mining district. Transporting raw gold to mints in New Orleans or Philadelphia where it was coined, and then back again to California was both time-consuming and treacherous. Small wonder, then, when the federal government began considering the construction of a US branch mint in San Francisco. President Millard Fillmore, perhaps the most obscure of all American presidents, recommended that a coining facility be established in the California city. In 1852, Congress voted in favor of the plan. A wealth of the yellow metal on hand, combined with an ever-increasing Western Frontier populace begging for circulating coinage, was more than enough incentive to authorize the creation of the San Francisco Mint. The first San Francisco Mint, as depicted in the above engraving, was quickly outgrown, and within 20 years was abandoned in favor of a much larger facility. The original San Francisco Mint remained intact until 1875, when in was razed to make room for a new Treasury building. Public domain image. 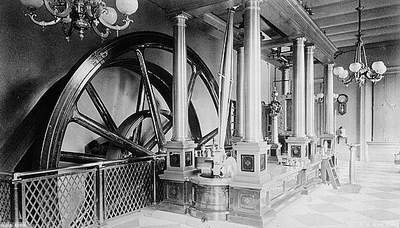 On April 3, 1854, the San Francisco Mint was ready for business. Relatively small by minting facility standards, the brick structure at the intersection of Commercial and Montgomery Streets produced gold pieces totaling only a little over $4 million face value in its first year of existence. The lack of chemicals utilized in the refining process and other start-up issues prevented the new facility from reaching its manufacturing capacity for a few years. 1854 Quarter Eagles ($2.50) and Half Eagles ($5.00) bearing the "S" mintmark are some of the rarest and most prized coins in numismatics, valued at well above $100,000 in better grades. The 49er Gold Rush and subsequent debate over California statehood dominated the news in the late 1840's and 1850. These were events that shaped the future course of the United States, both geographically and politically. For any of our readers wishing more details on these earth-shaking episodes, we recommend that you take advantage of the links above to delve deeper into their historical significance. 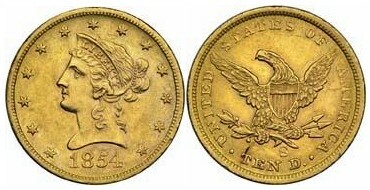 An 1854-S ten dollar Eagle, coined during the first year of the San Francisco Mint's existence. The above specimen, graded in About Uncirculated condition, is worth approximately $2500 on the open market. Photo courtesy of Ira & Larry Goldberg Coins & Collectibles, Inc., Beverly Hills, CA. Silver was discovered in Nevada's Comstock Lode in 1859, and much of it was brought to San Francisco for coining. By the mid to late 1860's, it was apparent the mint on Commercial Street would no longer be able to meet the burgeoning demand being imposed upon it. In 1874, minting operations were relocated to a much larger facility at Fifth and Mission Streets. 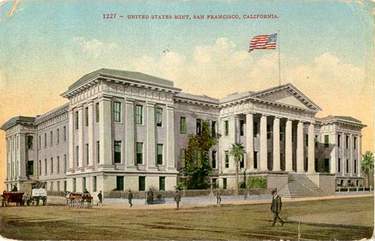 The original San Francisco Mint was then converted to a US Treasury sub-office. 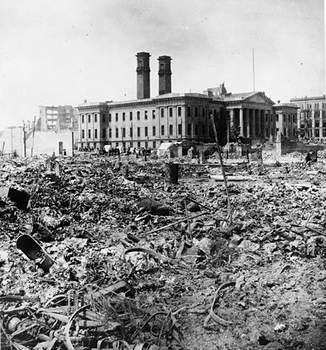 In 1875, the old mint structure was demolished and replaced by a new four-story Treasury building, which was gutted by fire in the aftermath of the 1906 earthquake. It was then reconstructed as a single-story building, and today houses the Pacific Heritage Museum. The museum has a permanent display documenting the history of the first San Francisco Mint and Treasury buildings. This postcard view captures the Greek Revival grandeur of the second San Francisco Mint, affectionately nicknamed "The Granite Lady". Public domain image. A site at Fifth and Mission Streets in San Francisco was purchased by the Treasury Department in 1869 for the purpose of constructing a much larger mint. Under the direction of Alfred B. Mullet, a Greek Revival design of majestic proportions was planned. On May 26, 1870, the cornerstone was laid. Sandstone from Newcastle Island in British Columbia was shipped for the upper floor facing and for the six colossal columns on the portico. The foundation, composed of Rocklin granite, was built around a "floating" concept, a revolutionary idea designed to save the building in the event of an earthquake. The overall blueprint also included a self-contained water supply, independent of the municipal system. Criticized as too large and elaborate, the new San Francisco Mint, nicknamed the "Granite Lady", was completed and occupied in 1874. The total cost of the project approximated a whopping $2 million. The ornate engine room of the Granite Lady Mint. Photo taken circa 1882. Image courtesy of Library of Congress. The second San Francisco Mint quickly became a crucial thread in the nation's financial fabric. Gold and silver from the West's bountiful mining districts found its way inside the Granite Lady's massive walls, where a substantial portion of America's hard money was coined. Gold coins were being produced in San Francisco in larger quantities than any of the US Mints. In addition, the San Francisco Mint struck coins for an array of Latin America and Pacific Rim countries. For 32 years, coin production continued uninterrupted. This all changed on April 18, 1906. It was on this date that the Granite Lady stepped forward, to take on a much larger role during the city's hour of greatest need, and forever won the hearts of San Franciscans. The Granite Lady stands tall amid the rubble following the 1906 San Francisco earthquake. Image courtesy of Library of Congress. A powerful earthquake shook San Francisco on April 18, 1906, destroying most of the city's buildings and homes. As the ground shifted, subterranean gas and water lines were ruptured. Many structures that somehow survived the quake were consumed by the resultant fire that raged out of control for three days. Thanks to its specially designed foundation, the San Francisco Mint building remained steadfast throughout the ordeal. 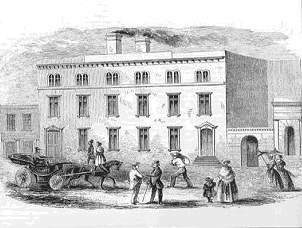 Drawing upon the Mint's own water supply, Treasury employees and US soldiers fought valiantly to extinguish the blaze that nearly engulfed the building. As the smoke cleared, the Granite Lady - along with its $200 million in gold reserves - was the only financial institution in San Francisco capable of operation. $1 million being transferred from Mint to banks in San Francisco to aid in the reconstruction effort following the great earthquake of 1906. Image courtesy of National Archives. 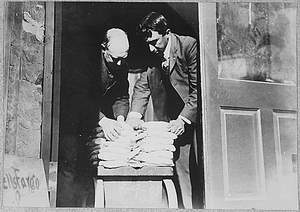 In the days following the disaster, the Mint was organized as the clearinghouse bank for San Francisco's relief and reconstruction efforts. Other emergency services were provided to help keep the city on its feet. In all, the Granite Lady responded ably in an emergency situation when called upon, in ways its designers probably never dreamed of. Coin production resumed shortly thereafter, but it was the 1906 earthquake incident that inseparably linked the Granite Lady to the history of San Francisco. 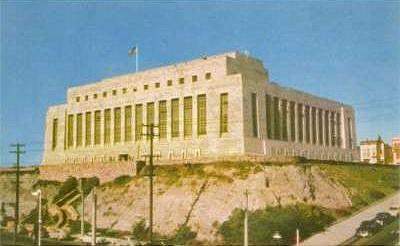 The third and current San Francisco mint, from a 1950's postcard. Readers not familiar with the city's landmarks might confuse the fortress-like structure with Alcatraz Prison. Public domain image. Once criticized for its enormity, the second San Francisco Mint was deemed to be too small and antiquated by the 1930s. In 1937, the third and present day San Francisco Mint began operations. Located on Duboche Street about a mile from the Granite Lady, the new Mint featured state of the art coining machinery. Measuring 208 feet long and 185 feet, the structure was built to three stories over the whole area, with two extra floors on the front side. At a cost of $1 million, the engineering marvel was built on a hilltop, and perhaps as much as anything else, resembled a prison. Many security features were included in the design, to keep Uncle Sam's gold and silver safe. 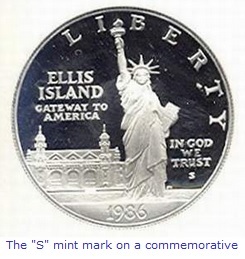 In 1986, commemorative coins were sold in celebration of the 100th anniversary of the Statue of Liberty. One such coin was the San Francisco proof dollar above, as indicated by the "S" mintmark. The San Francisco Mint closed down in 1955. The mints in Philadelphia and Denver were capable of striking coins in sufficient quantities to meet national expectations. In 1965, the coining presses were fired up again to help alleviate a coin shortage plaguing the nation at that time. Beginning in 1968, the characteristic "S" reappeared on coins originating in San Francisco. Today, the San Francisco Mint no longer strikes coins intended for general circulation. Instead, it manufactures proof coins for collectors, and is the only US Mint to offer regular proof and silver proof sets, and is the worldwide standard bearer for brilliant artistry and craftsmanship. Bullion based coins are also produced. Unfortunately, the Mint is not open to the public, as all floor space and resources are dedicated to coining activities. 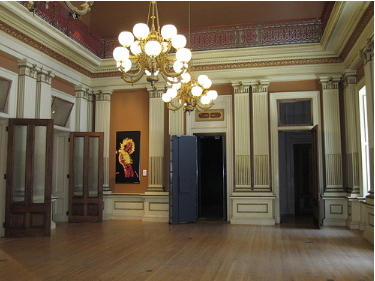 This June 2009 photo illustrates the restoration efforts of the old San Francisco Mint. The glass lamp chandeliers and other ornamentation of the Meeting Room were accurately restored according to detailed historical records and drawings researched from federal government archives. Image courtesy of sdstratt of Flickr.com. When coining operations were transferred to the third San Francisco Mint in 1937, the life of the Granite Lady continued. Treasury and other government employees occupied the premises until 1968, when the building was abandoned. A movement to demolish it gained serious momentum, but was quashed when President Richard Nixon intervened to save the historic structure. In 1972, a partial restoration project began. The following year, the Old Mint Museum was opened to the public, displaying collections reflective of San Francisco's numismatic heritage. 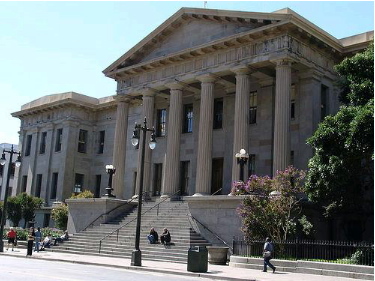 In 1994, an analysis revealed that the October 1989 Loma Prieta earthquake had caused structural damage to the old Mint. To make the building less vulnerable to another round of seismic shifting, many millions of dollars would be required to implement repairs. Again, the Granite Lady closed its doors to the public. After nearly a decade of fits and false starts, the city of San Francisco purchased the old Mint from the federal government for one dollar. In the August 4, 2003 conveyance-of-the-deed ceremony held in an ornate counting room within the beloved landmark, San Francisco Mayor Willie Brown cemented the deal with an 1879-S silver dollar, paid to officials representing the US government. The Granite Lady today. Image courtesy of superciliousness of Flickr.com. The estimated price tag to structurally reinforce the registered National Historic Landmark, while restoring it to its original grandeur and providing handicap access, was estimated at $95 million. The San Francisco Museum and Historical Society is overseeing the renovation project. They have set up a special site to follow progress more closely. This PDF report explains in greater detail the goals of the renovation and is beautifully illustrated. Planned exhibits focus on the history of the Bay Area, a "hands on" participatory workshop, and of course, an area dedicated to the story of the Old Mint, where once upon a time long ago, one-third of the nation's gold reserves were housed. In addition, a new San Francisco Visitors Information Center is being developed. When all is said and done, organizers anticipate up to one million visitors a year to the Old Mint. The $95 million is being raised through government grants and private donations. In 2006, the US Mint sold commemorative coinage celebrating the Granite Lady. The coins were issued in designs made of gold and silver, seen here. In all, a total of 57,666 gold half eagles and 272,857 silver dollars were sold, raising nearly $5 million in surcharges that went directly to the San Francisco Museum and Historical Society to benefit the project. Even though no longer available directly from the Mint, these special Old San Francisco Mint commemorative coins can still be found on eBay. Phase I of the renovation was completed in May 2011 at a cost of $13 million. Fund raising for Phase II is underway. UPDATE: On August 1, 2015, the city of San Francisco terminated its development agreement with the San Francisco Museum and Historical Society, putting an end to the plan for a museum at San Francisco’s "Granite Lady" Mint. The reason cited for the termination was the lack of progress by the society in hitting restoration target dates. The long term future of the landmark mint is uncertain. 1 Kiefer, Dave. "Historical Group Wins Old Mint Bid". The San Francisco Examiner, January 30, 2003. 4 Virtual Museum of the City of San Francisco. 5 Wehner, Michael. "New Life for Old San Francisco Mint". Coin World, February 3, 2003, pg 3. 6 "House OKs SF Mint Coins". Coin World, November 28, 2005, pg 1.